It works like any audio/video recorder. When you start the macro recorder anything you do in Excel is recorded as a new macro. How to record a macro? Optional Settings: You need not enter shortcut key and description to run your macro. After stopping macro recording, open Visul Basic Editor (ALT + F11) to view the recorded code. How to run excel macros? Press Alt+F8 to open the “Macro” dialog box. 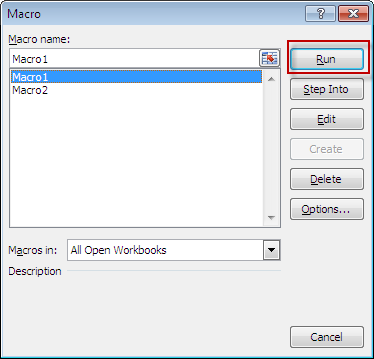 Select the desired macro from the “Macro Name” list and click the “Run” button. It does not create very efficient code. It is because most of these steps are not required when writing efficient VBA code. It creates codes for a static range (fixed range). In real-life scenarios, we generally need to write a program for dynamic range. Macro recorder does not create very efficient code. You can remove the words like: Select, Scroll. 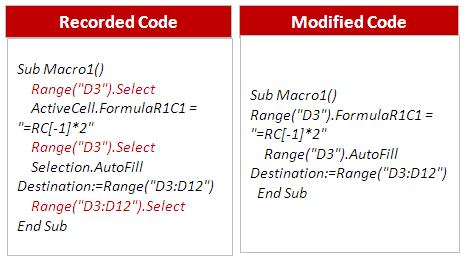 Rule of Thumb : You can remove the words like: Select, Scroll in your recorded macro code. 1 Response to "Lesson 2 : Record Your First Macro And Run It"